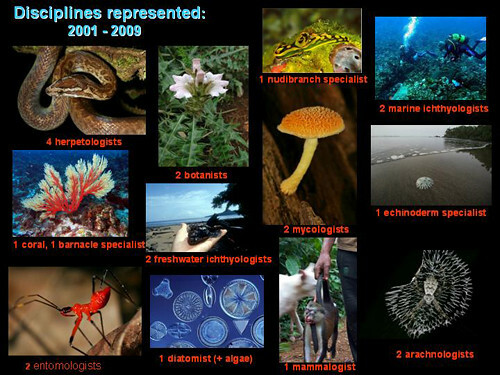 First, I thought it would be useful to illustrate, in one place, how many scientists have been involved in the Gulf of Guinea expeditions since 2001 including the folks going in January 2009 (Gulf of Guinea III B). Courtesy Dr. M. Vences, University of Braunschweig. Amphibians and burrowing reptiles are among the most obvious of the unlikely inhabitants on the two islands but there are more subtle oddities as well. 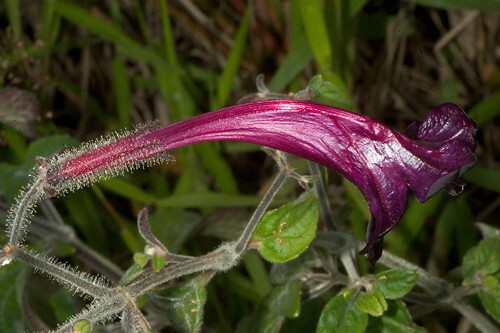 The plant group Acanthaceae (shrimp plants), which are the specialty of Dr. Tom Daniel (GG III – see May 2, “News From the Flower People”) is another group whose presence is surprising. The seeds of this group have no “wings” or other morphological adaptations allowing them to be blown by winds (wind dispersal is very common among plants – think of dandelions). They do not float, they are too heavy, and anyway they are not salt-tolerant. If that were not enough, shrimp plant seeds do not have endosperm; i.e. they are not nutritious and thus are very unlikely to be routinely eaten by birds or mammals, then transported as stomach contents. 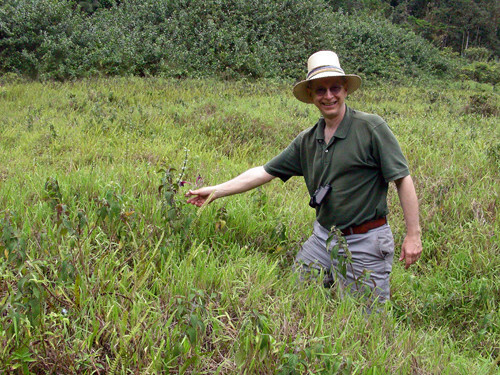 In fact, seed dispersal in this group is accomplished by the capsule that bears the seeds “exploding” and casting the seeds a matter of a few meters away from the parent plant. 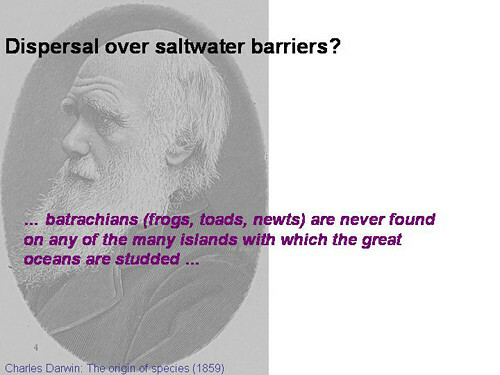 Yet, there are 15 species native to the islands (non-introduced), two of which are endemic. How did they get there across the water? I think the most likely answer to this question is that in the distant past these species crossed the marine barrier between Africa (the source) and the islands by floating on rafts. My colleagues and I published this “rafting hypothesis” about a year and a half ago, largely based on the study of one group of frogs; however, the more I learn about the island endemic fauna, the more I am convinced that this is the most likely scenario. The first thing to remember is that two of the mightiest rivers on earth feed directly into the Gulf of Guinea – the Congo and the Niger. 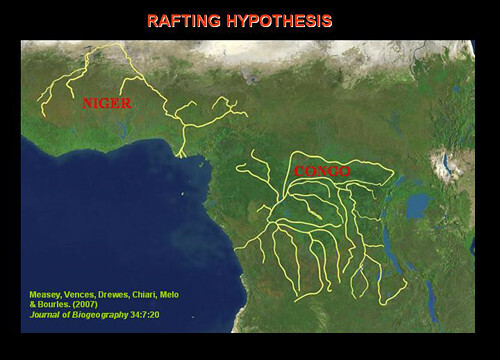 The Congo especially has an enormous drainage from deep within the African interior, and we know that the Niger flowed from current Lake Chad not so long ago; these might be considered amphibian freshwater highways from the interior to the coast. It is not difficult to envision rafts of matted vegetation, tree trunks etc., floating downstream on one of these great rivers and being discharged into the Gulf of Guinea. But we propose rafts composed of huge chunks of riverbank, chunks large and diverse enough to harbor burrowing forms and amphibians. Illustration by Richard E. Cook, San Francisco. 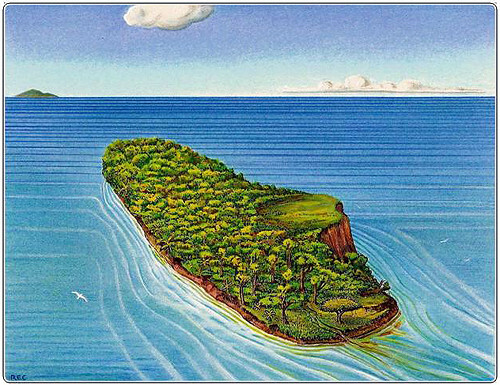 Such rafts might be many acres (hectares) in size such as in this drawing by my artist friend, Richard Cook. Rafts of this size might be expected to have rotten logs, trees, bushes rocks etc. Does this actually happen? Yes, such huge rafts containing all manner of wildlife are fairly common breaking off and floating down the Amazon and the La Plata (they are called Camalotes); however, in the case of the Amazon, they are not often discharged into the Atlantic. Rather, they tend to accrete together at the delta, forming large masses. 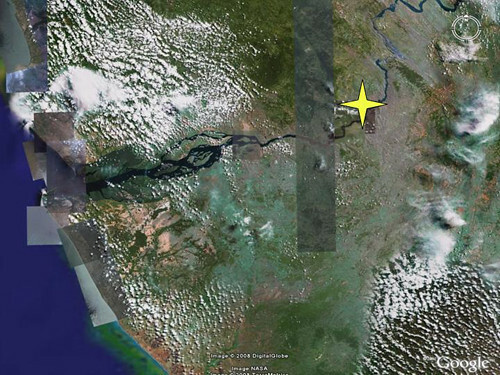 Satellite image, from World Wide Web. 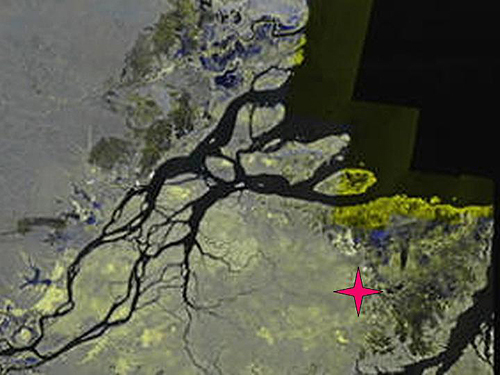 In the satellite image above, the red star indicates a large accretion island in the Amazon Delta called Marajó – it is about the size of Belgium! I can think of two possible explanations for why islands formed in the Amazon accumulate at the delta rather than float out to sea. First, notice above that the water remains relatively shallow for a great distance seaward from the Amazon Delta; this is because the continental shelf is about 200 miles wide before dropping off into great depths. 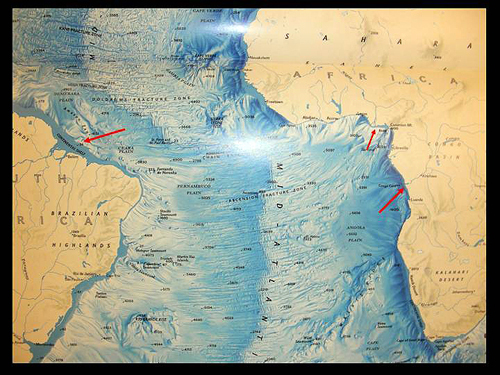 By contrast, the continental shelf off the Niger and Congo Rivers is much narrower (arrows on the right); moreover, just offshore from the Congo Delta is a deep abyss called the Congo Canyon. Second, I think the water velocity in the Amazon is significantly lower in the Amazon than it is in the Congo, at least. In fact the Congo is only navigable for about 80 miles inland. The yellow star in the image below is the town of Matadi, which is as far inland as one can get by boat. 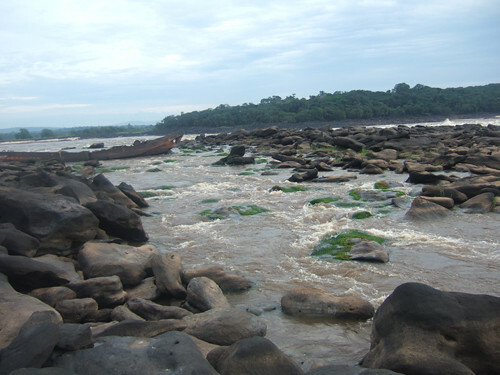 Upstream from Matadi are a series of rapids or cataracts formed as the river cuts though the African coastal uplift. Congo cataract. 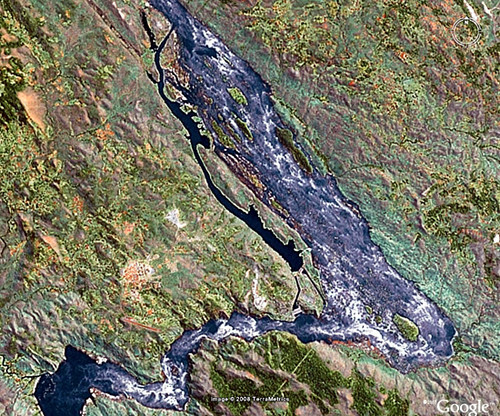 Google Earth image. Rapids below Stanley Pool, D.R.C. – Souljah phot. WWW. These rapids increase the water velocity so that I suspect the river is much swifter overall than the Amazon, and it is far more likely that floating objects would be ejected out over deep water from the mouth. How such floating objects would survive the cataracts themselves is an open question. Given a large chunk of riverbank being ejected out into the Atlantic Ocean from the mouth of the Congo, what happens next? The image above shows the mouths of the Congo and Niger (yellow stars) and the directions of the dominant ocean currents in the region. 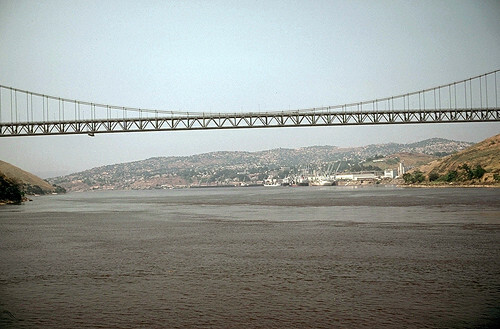 Note that any floating object ejected from the Congo River will immediately encounter the Benquela Current and be carried north; such an object from the mouth of the Niger will be carried East by the Guinea Current. 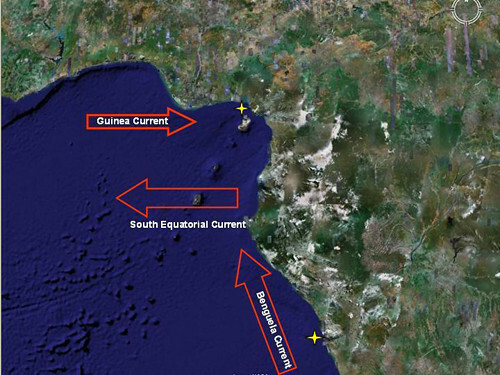 It so happens that these two major currents converge to form the South Equatorial Current which flows due west, right through the central Gulf of Guinea Islands! Conditions being perfect, we estimate that a floating object would take less than two weeks to reach São Tomé or Príncipe from the mouth of the Congo. But, given our knowledge of the physiology of amphibians, what about the effects of the saltwater during the voyage. Well, it seems that at predictable times of the year, the surface water of the Gulf of Guinea is not all that salty. 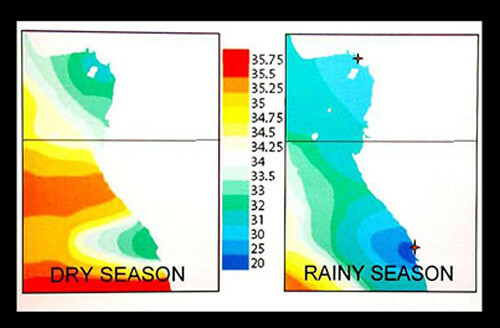 Notice that during the rainy season (around February) the surface salinity around the islands drops to around 31 parts per thousand of salt (technically it is brackish). Recall that because of differences in density, freshwater floats upon salt water. This sharp decrease in surface salinity is due to massive freshwater discharges of both the Congo and the Niger into the Gulf, plus the extremely high precipitation in the area as a whole. And of course, with high flow rates and the two mighty rivers in spate, this would be the time of year when pieces of riverbank would be most likely to break off and flow downstream. So a combination of factors, the locations of the rivers, the directions of the dominant ocean currents and periodic surface salinity changes, all point to rafting as the most likely way the amphibian ancestors of the current endemics actually arrived on the islands. We cannot prove this happened; we simply claim it is possible and likely. Moreover, , one must bear in mind that there has been a 13 million year period during which it might have in the case of São Tomé; as for Principe, it has been sitting out there “available for colonization for over 30 million years! 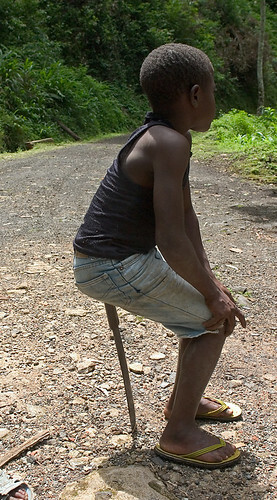 Angle of Repose on Principe. Weckerphoto, GG III. PARTNERS We gratefully acknowledge the support of the G. Lindsay Field Research Fund, Academy Research Venture Fund of the California Academy of Sciences, the Société de Conservation et Développement (SCD) for logistics, ground transportation and lodging, STePUP of Sao Tome http://www.stepup.st/, Arlindo de Ceita Carvalho, Director General, and Victor Bomfim, Salvador Sousa Pontes and Danilo Bardero of the Ministry of Environment, Republic of Sao Tome and Principe for permission to export specimens for study, and the continued support of Bastien Loloumb of Monte Pico and Faustino Oliviera, Director of the botanical garden at Bom Sucesso. Special thanks for the generosity of four private individuals, George F. Breed, Gerry F. Ohrstrom, Timothy M. Muller and Mrs. W. H. V. Brooke for making these expeditions possible.